Mainichi (basically AP) obituary. Japan Times obituary. (Couldn't find Yomiuri obituary because their page is unnavigable.) Frog in a Well post. Since this blog has a format I would describe as "all kibitzing, all the time", I find it difficult to switch into a more appropriate mode, but let me try: it fills me with awe to think that Seidensticker achieved things like his translation of The Sound of the Mountain without any Google whatsoever. A robber broke into a miser's house, flashed a gun, and said "Give me all your money." "I can't just give it to you," the miser complained. "How about this: I'll buy that gun from you for a thousand yen. Once you have my money, you won't need the gun anyway." After some thought, the robber accepted the offer and exchanged his weapon for a thousand yen. But as soon as the miser had the gun, he pointed it at the robber. "All right, cough it up!" he cried. "And not just the money you got from me -- I mean all the money you've stolen today! Hand it over or I'll ventilate you but good!" The robber burst out laughing. "That gun's just a toy," he said. "Go ahead and shoot -- fat lot of good it'll do you!" And with that, he fled through the front door. The miser tossed the gun aside and chased the robber out into the street. The two of them were grappling in the road when a policeman happened by, broke up the fight, and took them to the station. In the course of their investigation, the police were surprised to discover that the money the miser had given the robber was all counterfeit. The gun, on the other hand, was real. Both of the men were thrown into jail. Daigaku no waka-danna. Do not miss the swimsuit dance revue. It starts at 7'30". 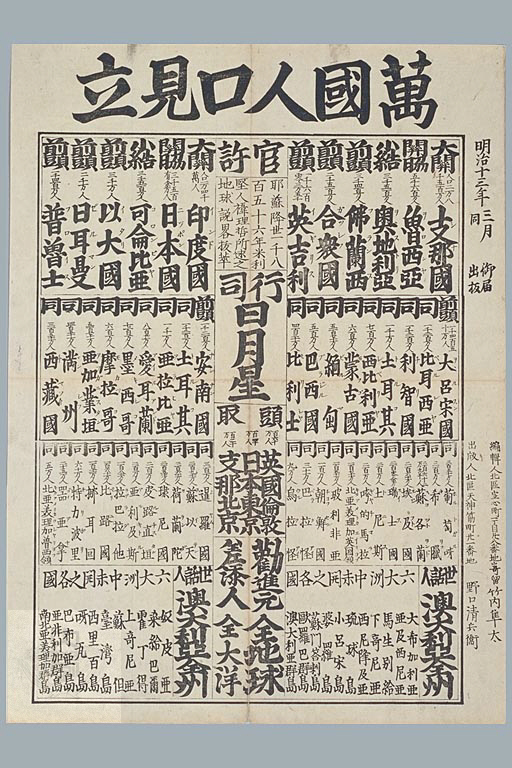 Those who need it, brush up on how to read a banzuke, then check out these sumo-style rankings. Countries, by population. China is the clear winner. Note the long-abandoned spelling 日耳曼 (pronounced zeruman) for Germany. Prussia's in there too: 普魯土 (puroisu ← Preuß[en]). Food and drink. Number one on the right ("nourishing and easy-to-digest") is eggs, closely followed by milk, chicken, and beef. On the left ("unhealthy and difficult to digest") the ōzeki is wild boar, with octopus and whale as runners-up. Fools. Scanned a little small for my liking, but includes such fools as ぬす人にあふてほらのけいこするひと ("people who brag [literally 'practice their conch-shell horn playing'] to thieves"), でつちしかつてやつとよけいじやうだんするばんとう ("bosses who scold their apprentices but kid around with the guys"), and いろゆへに心中をして死ぬるひと ("people who kill themselves in double-suicides over some fling"). Children, good and bad. The good children are on the right, and the best of the best are "children who study hard". On the left, the bad children all look up to their heroes, "children who don't listen to their father and mother". Other bad children of interest include the komusubi, 凧のぼし電信の障害する子 ("children who fly kites and interfere with communications") and one of the maegashira, 犬をけしかける子 ("children who tease dogs"). I'll just go ahead and assume that everyone here knows what moe (萌え) means. So check out the latest issue of King magazine's cover headline is "いい女に燃え！" I fear that we must interpret this as a sand-kick directly into Akihabara's face. Consider "燃え". Unless they're conjugating the archaic form 燃ゆ, there's no reason to use 燃え in that sentence other than as a reference to moe (萌え). But where the latter is spelt with a kanji that means "sprout" (probably due to a character-conversion mistake made by a single bulletin-board user long ago), King opt for 燃: burn. "Listen up, nerds!" barks King . "We've heard about your little moe thing where you collect cartoons of saucer-eyed little girls. We don't like it. Get with the program: Real-life foxy ladies in stripper underwear! Like this one! And while we're at it, moe means BURN!" Is Japanese entertainment, having completely exhausted the "pictures of girls in maid uniforms" angle, about to bite the dorky hand that fed them for the past couple of years? The name "Honnōji" is usually written "本能寺". However, at Honnōji itself, they usually replaced the middle character (能) with one of their own design in which the two little ヒs on the right were switched with a single 去. They reportedly did this because ヒ is associated with the pronunciation /hi/, which happens to be homophonous with the native Japanese word for "fire", and the management at Honnōji was especially antipathetic to fire because they had been devastated by it so many times. Anyway, use of this non-standard character was apparently limited to Honnōji, so when you find it on a roof tile, you can be fairly confident that the tile in question came from Honnōji too. 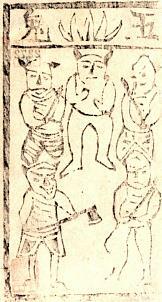 Archaeologists working at a site they suspected was Honnōji found such a tile. Don't miss the follow-up, with on-site photos. The agent in a passive construction: gesuto ni yorokobareru, "(be) rejoiced over by guests"
The experiencer (?) in an active construction: gesuto ni shitsurei ni naru, "(be) impolite to guests"
Trying to think of a parallel construction in English, the best I could come up with was something like "Most popular songs describes women who either stand or are dumped by their man." That said, though, I don't think this is particularly WTFic in Japanese, and two native informants agree. The fact that it's a headline rather than a sentence probably helps, but the real lesson is this: Zexy weighs a goddamn ton. "The mouth is the front door of the soul. If you do not guard your mouth closely, your true thoughts [which are supposed to be secret] will all escape. Thoughts are the legs of the soul. If you do not control your thoughts strictly, they will take you down some dark alley." The scalp is the chimney of the soul: as the fire dies down inside, less and less comes out. The beard is the front lawn of the soul: if you don't keep it trimmed, your wife will get mad and the neighbors will assume you're a terrorist. And James Brown is the godfather of the soul. Just because. Educational colored woodblock prints from 1873. Have I linked to this before? Oh well. First comes the practical material. For example, Types of rice . "Broadly speaking, [rice] can be divided into three types: uruchi [non-glutinous], mochi [glutinous], and tōboshi [a native, red variety also called akagome]. Uruchi and mochi can each be further subdivided into early, medium, and late strains...." Japan's early-Meiji program to catch up with Europe and America in the boredom race had clearly already born fruit. The "moral lessons" aren't much better. This studying boy (勉強する童男) depicts its anon/eponymous hero as a frowning midget in a sembei box practicing his calligraphy while his peers frolic with dogs and toys outside. On the other hand, carelessness (疎漏) can get your legs set on fire. Next comes what really makes the site worth linking to: Japanese-style pictures of the "great names of the West". You knew that Ben Franklin drawing down the lightning would be in there, but I bet you never expected James Watt getting scolded by his aunt for staring at the kettle. The natural laws and paper models are just a letdown after that. Original tu saie addò? tu saie addò? Translation They're very strong! They're very strong! Original farme nun pò! farme nun pò! Original te lassa sta! te lassa sta! Original 'ncielo a guardà! 'ncielo a guardà! Translation They're very smelly! They're very smelly! Original Funiculì, funiculà, funiculì, funiculà! Original Jammo, jammo jà, funiculì, funiculà! Minna de hakō, oni no pantsu! Translation Everybody put them on -- oni underpants! * Gesture < furitsuke < dance. My new apartment is within walking distance of Enoshima, and I walked there last weekend. 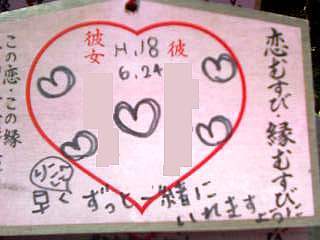 There is a shrine on the island where couples can buy a small, tacky piece of wood, write their names on it, and hang it carefully with thousands of others to ensure that they will stay coupled. 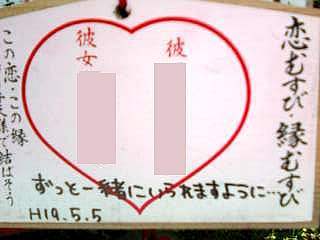 The first one reads ずっと一緒にいられますように, zutto issho ni iraremasu yō ni, which roughly translates as "May we always be together". The second one expresses the same wish, but spells it differently: ずっと一緒にいれますように, zutto issho ni iremasu yō ni. Ra-nuki offers two advantages: it distinguishes the the two forms from each other, and it normalizes the pattern to (r)e/(r)are for all verbs. The old system, on the other hand, is traditional, which means that a certain proportion of the populace will never deem any deviation from it acceptable, particularly in written Japanese -- even if they use ra-nuki occasionally in casual speech without realizing it, which many if not most of them probably do. But, as the photos above show (and here I reveal that they are using the potential form of i.ru, technically translating as "be able to be together"), no-one can stop language evolution. The nuki in "ra-nuki" is also used in the Japanese equivalent of "Hold the onion/anchovies/etc. ": "X-nuki de...". I'm back. The move is complete, the dishes are in their cabinet, and my telephone cable is aYouTube with broadband. Let us begin the new age of No-sword... with a newsprint photograph of Helen Keller in a kimono. Keller visited Japan several times after her celebritification, and documentary evidence is all over the web. But I had never seen this uncredited photo from the 1948/11 issue of Shufu no tomo (a.k.a. "the Shufu-no-Tomo", a.k.a. "Home Journal for Ladies", literally the "Housewife's Friend"). 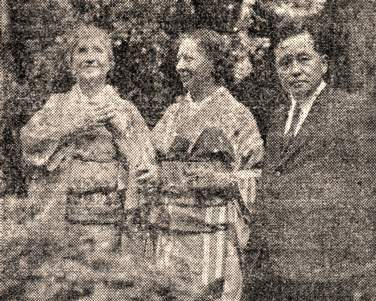 The woman next to Keller in a kimono of her own is Keller's secretary, Polly Thomson. The man almost out of frame to the right staring directly at you is Shufu no Tomo president ISHIKAWA Kazuo, who presented them with these new hōmongi on behalf of the entire Shufu no Tomo organization. After thanking Ishikawa for the new kimono, she then directed him to tell his readers that she was about to tour Japan and do everything she could for its still-suffering people, wherever she found them. Then, she was off to Korea, China, and parts west. Bonus link: Can Helen Keller Lead Secure Life in Japan? (PDF). "Oh, we do like Japan!" What is Food for Language? This is my personal blog. The views and opinions expressed herein do not necessarily represent those of my employer or anyone else.